A statue of Michael Jackson has been removed from the National Football Museum in Manchester. Its removal comes as sexual abuse allegations against the singer are detailed in a new documentary film. The statue was commissioned by Fulham's then chairman Mohammed Al Fayed following Jackson's death in June 2009. The National Football Museum (NFM) said the statue had been taken off display as part of "ongoing plans" to "better represent" football's stories. Two men, James Safechuck and Wade Robson, allege in the Channel 4 documentary, Leaving Neverland, that they were sexually abused by the superstar. There have been reports of radio stations dropping Jackson's music from their playlists, while some fans on social media have said they are boycotting the star. An NFM spokesperson said: "Plans have been under way for a number of months to remove the Michael Jackson statue from display as part of our ongoing plans to better represent the stories we want to tell about football. "As a result of this, the statue has now been removed." Mr Al Fayed installed the statue outside Craven Cottage in 2011 but new owner Shahid Khan had it taken down in September 2013. The artwork was originally due to be erected at Harrods before Mr Al Fayed sold the Knightsbridge store. 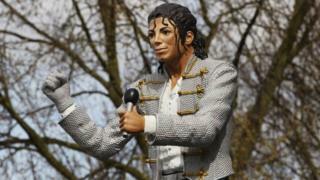 His decision to place the Jackson statue outside Fulham's stadium was unpopular, with supporters saying it made the club a "laughing stock". Mr Al Fayed robustly defended the statue, saying: "If some stupid fans don't understand and appreciate such a gift this guy gave to the world, they can go to hell."